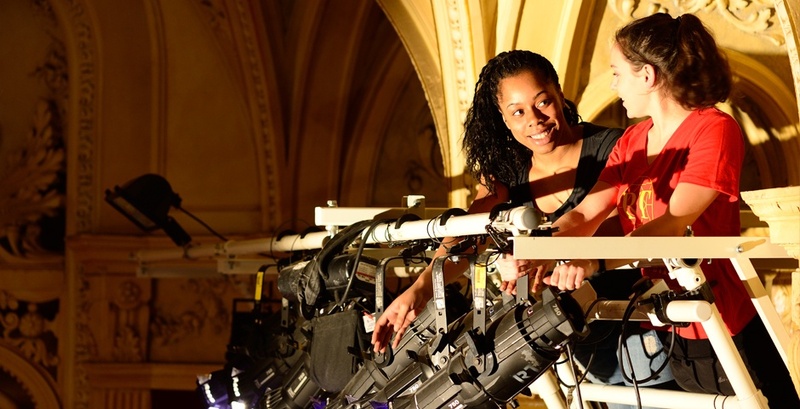 The theatre industry's thriving - both artistically and commercially - in the UK. That's not to say that cuts to the arts aren't taking their toll, but attendance and interest are high, creative output is impressive, and the business is driven by enthusiasm and an entrepreneurial spirit. It is an exciting industry to be part of! If you've decided you want to work in theatre, you may be wondering how to get started. From the outside, the theatre working world can feel an impenetrable one: obtuse, unfamiliar, and cliquey. So what can you do? How to get a job in theatre? Remember, you can work in the theatre and NOT be an actor. Often, working backstage or in arts management seems to imply that you harbour secret fantasies of having your name up in big sparkly lights. Far from it! There is a huge range of jobs in the theatre industry, whether you want to work in an 'artistic' job or not, and we need different people with different skills to make it successful. At ATG, some departments and roles you might not have considered before include property and venue management, stage door keeping, interior design, risk management, insurance, HR, finance, creative learning, ticketing, revenue management, marketing, PR, UK and international venue acquisition, customer experience management, front of house roles and box office management, administration, PA roles, training and staff development, payroll and accounting, IT and software development. Other theatres and companies will have different jobs and departments. ATG's venue are receiving houses, meaning shows tour to us but we don't create them in the actual theatre buildings. This means we don't have departments like costume, make-up, or stage management in the theatres. These roles are part of teams put together by producers directly. ATG has a Casting team, who find performers by watching performances and industry events as well as by working with other casting directors. As well as a wide range of job types, there are different ways of working. You may want to apply for permanent roles and stay in a company for a while, or you may prefer to be freelance and gain experience working in different roles and environments. You may want to start your own company; ATG was started by Rosemary Squire and Howard Panter in 1992 and has grown from there. According to Creative & Cultural Skills, 43% of people working in the creative industries in 2015 were freelance. You can find out more about what this means on their website. · The Stage - "Ultimate beginners' guide to theatre jobs 2016"
No one's going to hide it: it's tricky. Lots of people want to work in theatre, so there is competition for every role; this means employers can be very selective. Jobs often require specific skills and experience which can make it hard to get your foot on the ladder. Workers in the creative industries are also almost twice as likely to have a degree as the general population. As a result, work experience and internships are very common and can be a great way to gain the experience you need to get started. Having said that, there are a range of entry-level jobs with ATG that may also interest you, so do keep an eye on the ATG Tickets Jobs page. The person specification will tell you which skills and experience are required. Read more about creative industry growth from the Creative Industries Federation. · Talk to everyone you can: try to meet people working in theatre at events and ask anyone and everyone for advice (don't be shy - people like sharing their words of wisdom). · See as much theatre as you can: it indicates enthusiasm and people are bound to ask you what you've seen recently. It will also help you decide the kind of company you want to work in. · Join our Front of House team: there are opportunities to join the team in all our theatres and it is a great way to experience working in a theatre environment. Many people at ATG started out working in a Front of House team, whether theyve stayed in customer experience-focused roles or used the experience to move into another specialist area. You can find out more about working FOH with us in our feature. · Try and get involved in any productions or events you can: whether this is as a participant in a Creative Learning project, performing or producing with your school or university, or working freelance in an events role, the experience will be invaluable in developing your skills. There are over 3,500 people working at ATG, and many different routes into working with the company. Some people will work for the company for a short time and some for many years, some will start out in the company and work their way up, and some will work in other companies or industries and come to work at ATG later in their career. Creative Learning freelancers are welcome to send speculative CVs to the Creative Learning Manager directly. You can find their contact details on our Creative Learning website. Technical casuals are welcome to send speculative CVs to the Technical Manager in the appropriate theatre. Front of House vacancies are frequently advertised on our website, or you are welcome to leave a speculative CV to Stage Door. Please don't be put off by the fact that theatre doesn't fit neatly into the classic job mould, or how overwhelming the mire of options might feel. Get involved, and ask for help. As much as it's about being in the right place at the right time, it's also about working hard to make that luck happen!